"Holmes was born in Cambridge [Massachusetts] in 1809. After [graduating] at Harvard he tried the law for a year, during which time he wrote more for the Collegian than in any notebook on Kent or Blackstone; finally, he adopted medicine as a profession, and went to Europe to study in Paris. 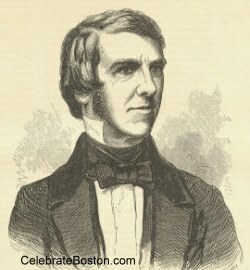 In 1836 he returned to America after an absence of nearly three years, took his degree at Cambridge, recited Poetry, a Metrical Essay, before the Phi Beta Kappa Society, and published his first book of poems. Old Ironsides is a fair specimen of Dr. Holmes's lyric power, but his prevailing characteristic is a deftness of touch that produces sudden exchanges of pathos and humor under the reader's very eyes. He is a sworn foe of all morbid sentimentality and pretence. The Autocrat if the Breakfast Table was written in 1857 for the opening numbers of The Atlantic Monthly, to whose success it undoubtedly contributed very much. The wit, satire, and sentiment of these original colloquies gained for them an immediate and lasting popularity. The Professor at the Breakfast Table was followed by the Poet in 1872, and still the readers of the Atlantic showed no signs of weariness. The medical studies and Puritan antecedents of Dr. Holmes were not without a strong influence on his inquisitive mind. Two powerful works testify to the interest their author took in subjects that few pens could have treated so healthfully. Elsie Venner (1860) is the dramatic statement of the problem growing out of a personality hampered and yet preserved by pre-natal influences. The Guardian Angel (1867) is one of the most healthful and characteristic of American novels. The public is also indebted to Dr. Holmes for a biography of the historian Motley. Holmes has been called the poet laureate of America. As a lecturer, after-dinner speaker, and companion, he is unrivaled among men of letters. He is a rare instance of a character whose business seems always to be his pleasure. He lived during part of the year in Boston; [and] during the remainder at Pittsfield [Massachusetts], on what he characteristically [called] 'the remnant of twenty-five thousand ancestral acres.' "